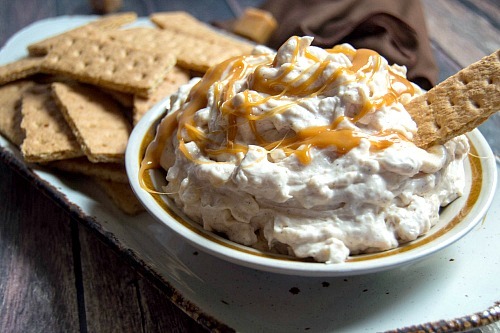 No-Bake Caramel Apple Cheesecake Dip Recipe. There are a couple of flavors that I feel are signature fall flavors. 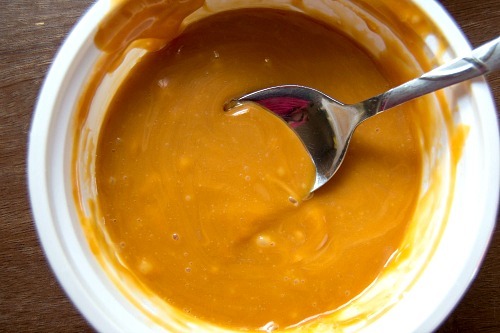 Pumpkin is an obvious one, but I also feel that caramel and apple are key fall flavors. Which means I just had to put the two together! 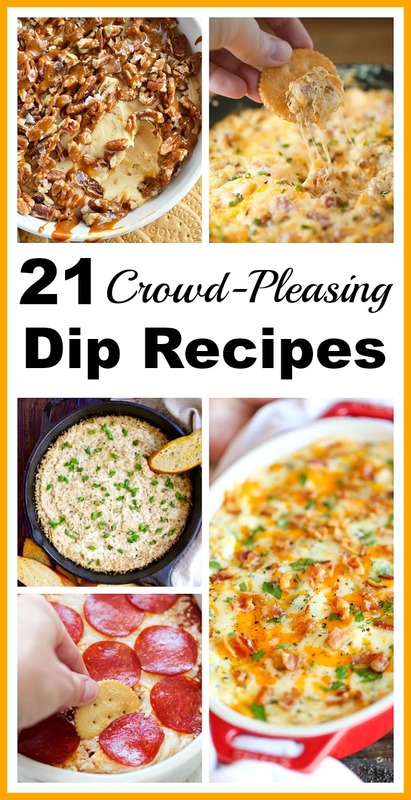 I’ve had the baked version of this dip before, but who wants to wait 30 minutes for something this delicious? Plus, it’s always more frugal to keep the oven off. 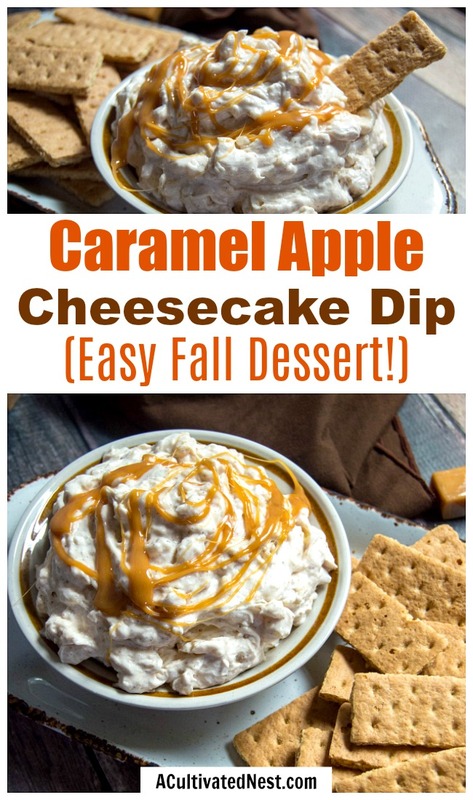 So I decided to make mine a no-bake Caramel Apple Cheesecake Dip! 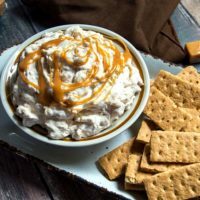 This homemade caramel apple cheesecake dip is delicious as a party appetizer or sports party dessert! Or just as an after-school snack. 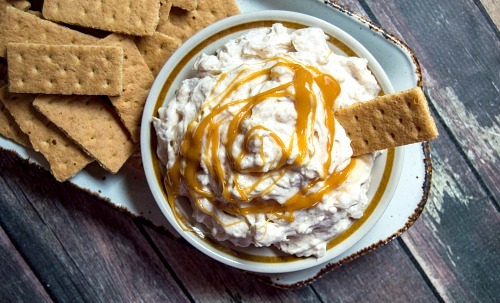 Quick, easy, and inexpensive to put together, this cheesecake dip is sure to quickly become a fall favorite in your household! And if you happen to find yourself with too many caramels after Halloween, this recipe is a great way to use up extra caramels! Whipped topping, nuts, apple chunks, a dash of cinnamon, and/or a drizzle of caramel sauce (not the melted soft caramels, as it will harden). Graham crackers, cookies, and/or fruit (like apples!). 1. Unwrap caramels and put in a microwave safe bowl. Add the Tablespoon of milk on top. Microwave for 30-50 seconds, until melted (CAREFUL – very hot!). 2. 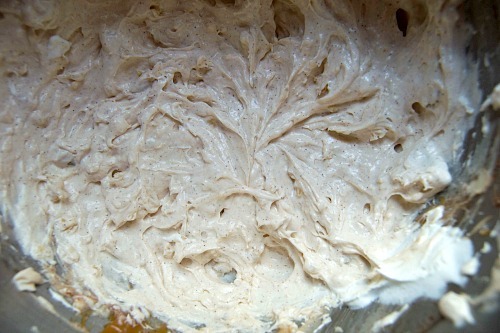 Using a stand mixer with a whisk attachment or hand mixer, beat cream cheese for about 20-30 seconds. 3. 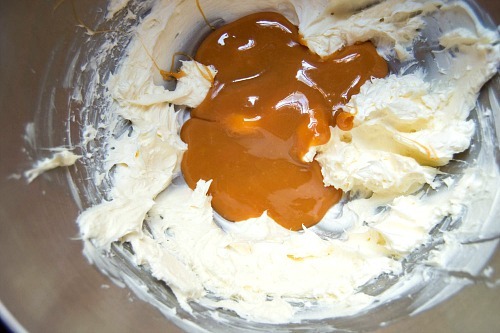 Pour melted caramels that have cooled for about 30 seconds into whipped cream cheese and whip and blend until incorporated. 4. Add apple pie filling and cinnamon and whip on high for about 20 seconds. *Since the apples are soft, they should break down into smaller chunks. You can help this along by using a butter knife/hard spatula to scrape down the sides and drag it through the apples to make smaller pieces. 5. Add whipped topping and mix on low until combined. 6. Add optional toppings from the list above. Refrigerate until ready to serve. Serve with one (or more) of the serving ideas above. Then enjoy! What’s your favorite thing to dip into treats like this? For an easy, inexpensive and delicious no-bake fall dessert, you have to try this caramel apple cheesecake dip! It’s also a great party appetizer! 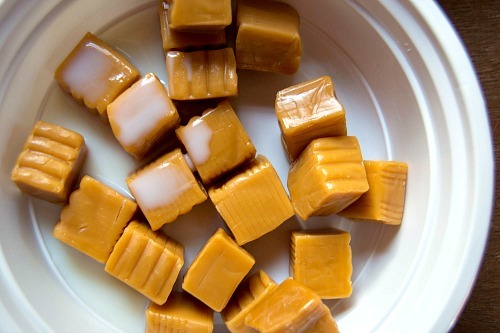 Unwrap caramels and put in a microwave safe bowl. Add the Tablespoon of milk on top. Microwave for 30-50 seconds, until melted (CAREFUL – very hot!). 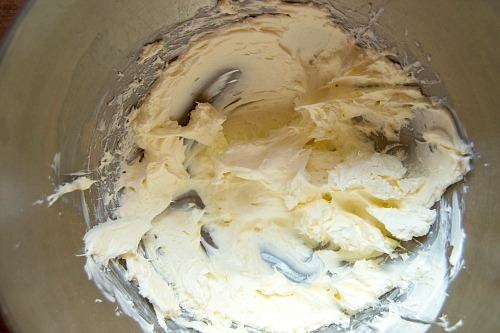 Using a stand mixer with a whisk attachment or hand mixer, beat cream cheese for about 20-30 seconds. Pour melted caramels that have cooled for about 30 seconds into whipped cream cheese and whip and blend until incorporated. 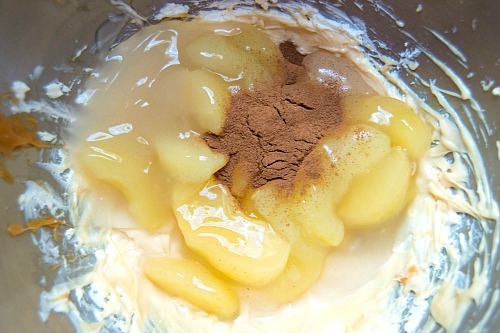 Add apple pie filling and cinnamon and whip on high for about 20 seconds. *Since the apples are soft, they should break down into smaller chunks. You can help this along by using a butter knife/hard spatula to scrape down the sides and drag it through the apples to make smaller pieces. 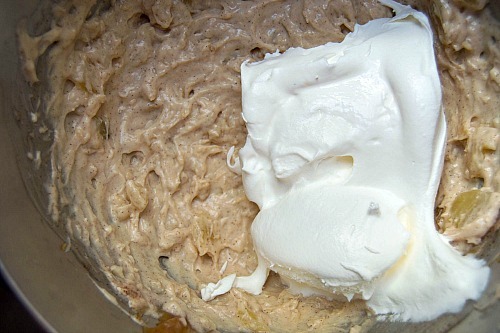 Add whipped topping and mix on low until combined. Add optional toppings from the list above. Refrigerate until ready to serve. Serve with one (or more) of the serving ideas above. Then enjoy!